This is a long post, but a lot happened over the weekend. Don't miss the videos at the end! Shaun's boss: Hey Shaun! I think you are not feeling well. Shaun: I am doing great! It was nice to meet your family at dinner and chat with you. Shaun's boss: Thanks, but I really think you are not feeling well and you should not show up to work tomorrow. Shaun: What do you mean? I feel great! I have a presentation to give tomorrow. Shaun's boss: Screw the presentation! Your sick! I don't want to see you at work tomorrow! Have fun with your friend, Dave. So, it was "out" we went for Shaun's first weekday off of work. We were joined by a couple of classmates I met that night. They took me to a street lined with shady bars, street vendors, and pretty (and some not so pretty) girls calling you into the bars. I have never seen such a scene. The bars were filled with women! An 80/20 ratio at least. However, after we gr abed our drinks and headed over to a table I quickly learned why there were so many girls. It was great how the staff got you to buy more drinks. I played "Connect 4" with one of the staff and was beaten most of the time. I think she had had plenty of practice. These bars had all kinds of rooms that had all kinds of things going on there. I could go on and on about what I witnessed, but I will just say, "it was an education! " Friday started with breakfast at 5am as we were headed home from the bars. We woke up a little later and headed out for sight seeing. We checked out People's Park first. It was smaller than I imagined, but had a great museum full of art and artifacts. Afterwards we stopped by the Shanghai 2012 building, but we could see the model of Shanghai from the doorway and decided that it was not worth the price of admission to see it up close. Soon we were walking down Nanjing Rd. I went there on my first night in China, back in April. It is not much different during the day time, except the hawkers are trying to sell you "watchbagDVD", instead of "pretty girl." 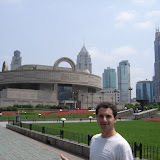 We looked at a few shops and walked to the Bund. That night we met David Hudgens, our internship advisor for dinner. It was great to have some one-on-one time with David. He has spent a great deal of time in China and knows the area well. Saturday, the fun continued after we grabbed a train ticket for my Sunday morning departure. We went to Pudong (on the other side of the river). Pudong is an area that virtually did not exist 10 years ago except as swamp land. Now it is an economic free trade zone and thriving with tons of businesses setting up enormous buildings there. We went up the Mao Tower for a nice view 87th floor view of Shanghai. It reminded me quite a bit of sitting up at the top of the John Hancock building in Chicago. We had a coffee and soaked up the view. After a river-side lunch, we headed to the knock-off market. This is the largest I have seen. It was quite amazing. They had everything you could want, except I didn't see much jewelry, but it could be located in another section of the market that I never discovered. I am constantly amazed at the people and how they have learned to handle rejection. They approach you and you ignore them as best you can, but they just keep trying. They don't care that dozens of other people offered you the same things ten seconds before you got to them. The best was two guys wrestling each other as they went down the hallway. As they held each other in headlocks, they stopped in front of me and ask, "watchbagDVD." The day ended with a great dinner at a Sichuan Chinese restaurant. We ate several spicy dishes until our bellies ached. Sunday I returned to Wuxi and played one last game of softball. The night was spent eating on Chicken Street with some friends that are leaving this week. They even had a friend visiting that grew up in Memphis! My first Memphian in China. Good times were had by all. A video I shot while walking to the metro station this past Sunday morning. I was amazed at the stamina of these ladies. It is great to see some of the Chinese culture performed for you in the public. These type of events occur every weekend all over China and are really fun to watch. This video shows Chicken Street in Wuxi. What a place!